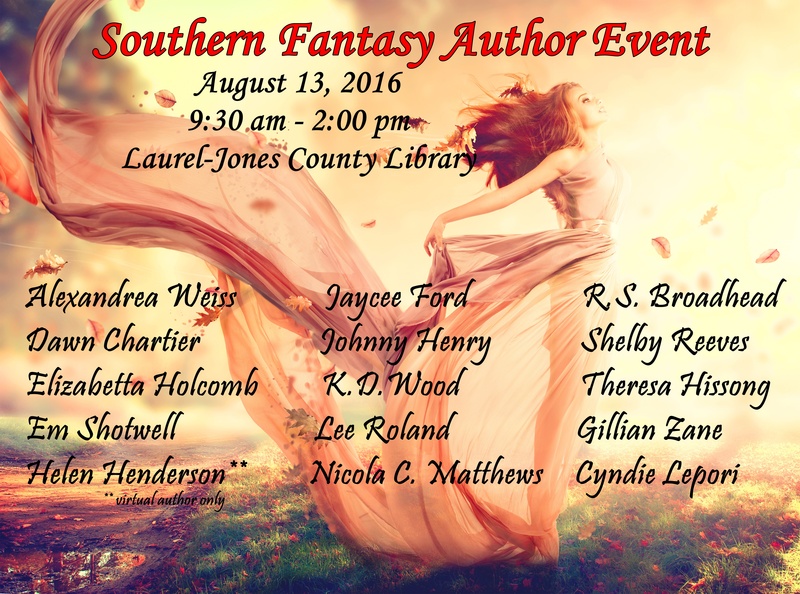 The first annual Southern Fantasy Author Event is being held Saturday, August 13, 2016 at the Laurel-Jones County Library in historical downtown Laurel, MS from 9:30 am to 2pm. Come join fourteen fantasy authors from across the south for a day filled with fun, prizes, and down home charm. You won’t want to miss your chance to hang with some of the south’s best fantasy authors and get to know the writers behind the pen. There will be a raffle with all proceeds benefiting the Laurel-Jones County Library. Prizes include autographed paperbacks, candles from the Shining Sol Candle Company, and a 7″ Amazon Kindle Fire tablet and cover. Come join as we celebrate southern hospitality and authors who make fantasy into a reality.